If you still carry five-pound projectors to meetings and presentations, your prayers have been answered. With the latest generation of pico projectors, bulk is becoming a thing of the past. 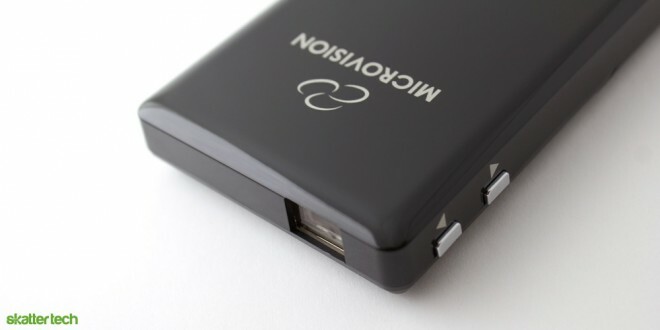 We recently came across MicroVision’s SHOWWX+ at MacWorld 2011, which packs an impressive punch. Their laser projection technology, which does not require manual focusing, is brighter and smaller than anything I have seen. For those unfamiliar with pico projectors, these are essentially a compact handheld battery-powered gadget for getting presentations, product demos, or videos from your pocket to the big screen in a matter of seconds. After unpacking the device, I managed to get my computer screen projected onto an empty wall without any fuss. The projector uses a microUSB port for recharging, which makes it convenient to plug into a laptop when a power outlet is out of reach. An AC adapter also comes in the box with a set of common wall pins for multiple countries, which is great for travelers. 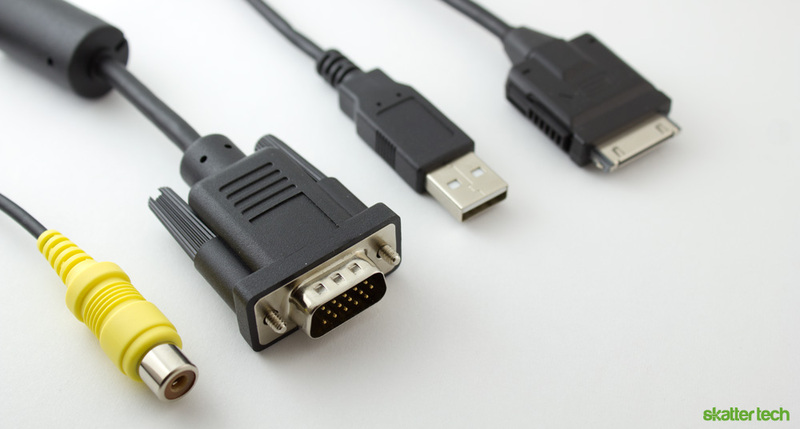 MicroVision includes adapters for composite input and an iPod dock connector in the packaging. I was also sent an optional VGA (RGB) dock accessory which made it possible get my Dell XPS Windows 7 laptop working with the SHOWWX+ projector. There is disappointingly no HDMI compatibility. The iPod connector plugged straight into the iPad and videos appeared on-screen without any issues. The projector worked with the VGA output on my Chrome Notebook too. I even managed to plug the device into the back of a TiVo to check the composite output and it also worked like a charm. The SHOWWX+ is roughly the size of a smart phone such as the HTC Thunderbolt. It weights a little over 4 ounces, extends 4.64 inches tall, 2.36 inches wide, and is just 0.55 inches thick. 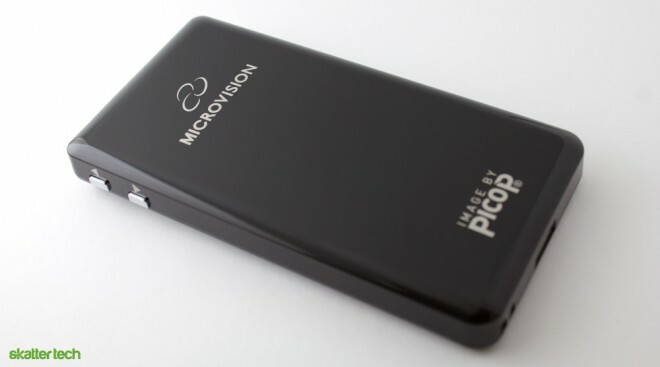 Since the glossy body is a fingerprint magnet, MicroVision includes microfiber sleeve for storage. Skatter Tech reviewed the 3M MPro120 pico projector last year and the differences are astounding. The SHOWWX+ has richer colors and a much brighter image. Having to manually focus an image is always a nuisance and I love that the MicroVision laser technology is in focus at all times. For those wondering about the magic going on inside, lasers beam light onto a tiny mirror which exits the unit without needing lenses. This ensures a pixel perfect image without having to deal with manual focusing. The projected image is a WVGA 848-by-480 pixel resolution, which is still a bit underwhelming. Web sites including Skatter Tech unfortunately do not fit within the available space. Videos on the other hand scale to the lower resolution without any issues. Text appears very crisp making reading presentations easy. A grid-like layout is very visible, but it is not a problem if there is enough separation distance between the audience and the screen. I was glad to find that the VGA dock sports a standard tripod screw head making it easy to mount. The SHOWWX+ projects at a 45 degree angle, so placing it on a flat surface also works. The image is almost always curved despite adjustments. It is something you will probably have to accept. I noticed that you can get the device as close as a foot away from a wall without loosing sharpness. MicroVision claims up to a 100 inch diagonal projection, however the image will be barely visible if you are not in a very dark room. Despite 15 lumens, brightness diminishes quickly the further away. I found that 50 inches was an optimal distance with a good balance between brightness and quality. If you are looking dump a full-blown projector for one of these, you should probably know that the SHOWWX+ is still difficult to view under standard office lighting or even moderate sunlight. It works best in a dark room or with shades down. It is not nearly as bright as dedicated projector, but it is still an awesome alternative for those who do not want to carry around a large device. MicroVision claims about two hours of battery life and my results came in just a few minutes shy. This makes it long enough for quick presentations or even most movies. I should note that it features a removable lithium-ion battery, which is a major plus for swapping on the go. I am sure that future iterations will last even longer, but I would not want to give up the slim streamlined design. The MicroVision SHOWWX+ packs a unique laser technology that sets it apart from the standard DLP LCoS models. Pico projectors are getting better looking, brighter, lighter, slimmer, and run longer on batteries. Unfortunately, these still have a long way to go when it comes to replacing traditional projectors. The WVGA resolution is rather low and these are nearly impossible to use in a normally lit work meeting room. With that being said, the SHOWWX+ is probably one of the best ones I have seen, but it also comes with a cost. MicroVision states a $449 $399 MSRP, which is quite pricey. Fortunately, I have seen it for as low as $360 through retailers such as Amazon, which is a bit more reasonable. For the most part, if you understand the limitations with the current state of pico projection technology, the SHOWWX+ will not disappoint. It makes an excellent addition to any briefcase and will definitely impress others. It is still a premium gadget and I would suggest holding off a bit longer if you are not in a rush for one. I am confident that next year’s models will be brighter and more affordable. With a promotional code, you can get the ShowWX for $199; how about that for a great deal? I think it expires 03/31/2011 though. Best Pico projector I have seen. Great for traveling around and giving powerpoint presentations. Thanks.